Swimming is one of the best exercises your body can do. Not only does it work most of your muscles but it is very low impact on your joints. Sometimes though you want to add a bit more strength and tone to your body and that’s where the best water barbells are perfect. In order to get the best water weights for you, aspects liked the weight, size and type will be important. Here we will go through all those key areas and we have also completed water barbells reviews to show you the best products on the market, and once you’ve finished reading, you’ll know the perfect product for you. 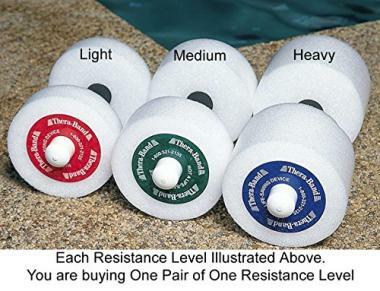 TheraBand have been able to produce these top rated water weights that are going to be perfect for your aquatic exercise regime. They are available in three different weight types depending on your needs and provide a comfortable grip and the right amount of buoyancy you need to be able to increase your flexibility and strength. 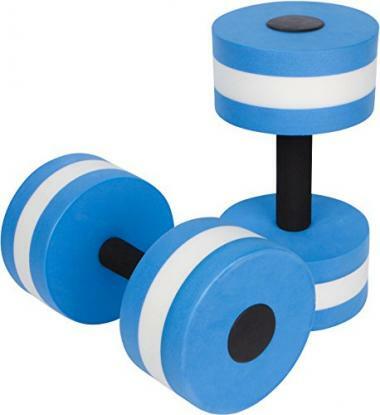 These water dumbbells from ZEYU are another quality product and are made from EVA foam that is going to be able to give you a very high level of buoyancy without absorbing any water. There are many different colors available allowing you to choose your own style. In terms of what makes a great swimming barbell, this product ticks all of the right boxes. It is made from EVA foam that is going to be able to give you the buoyancy that you need and this is another product that comes in a great variety of different colors. This is a great aqua barbell from bintiva and another one that comes in three different size options which will allow you to choose the perfect one for your needs. The foam of these products is going to be able to give you a great level of durability and resistance. Speedo are one of the most well-known brands when it comes to water products and they have been able to produce great aquatic dumbbells too. They have a soft padded grip for a high level of comfort and they are made out of lightweight chlorine-resistant foam. 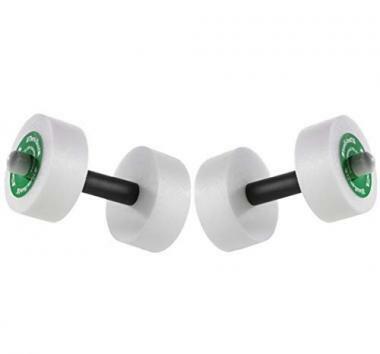 These pool dumbbells from TheraBand are another top quality product from them and come in a slightly different design, as the foam is all white. The grips of these dumbbells are very comfortable to ensure that you can have an extended session without having sore hands. 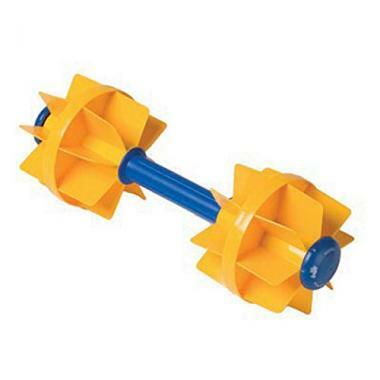 Kiefer have been able to make these underwater dumbbells which are another product that comes with a unique design. One of the great features of this product is that it has fillable handles, allowing you to change up the weight of the product. TheraBand have been able to produce this barbell which is a lot different as it has a much longer handle to have a two-handed grip. 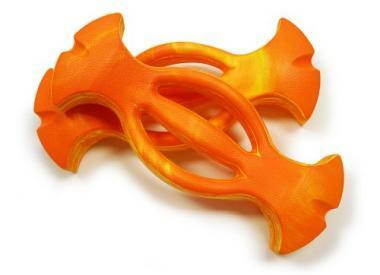 That makes it ideal for a wide range of different exercises and is made from high-quality and durable foam. 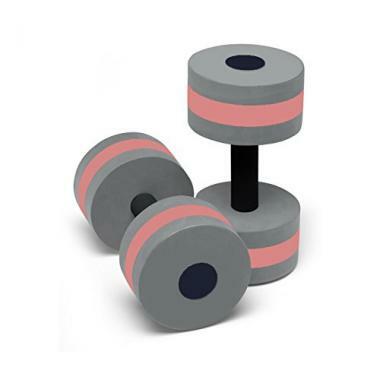 Power Systems have been able to produce this dumbbell that comes in three different size options of light, medium or heavy depending on what amount of resistance you are going to need. They are made from a soft and non-abrasive EVA foam that is very high-quality. One of the best parts of using water barbells is the wide range of exercises that you will be able to do. When you are in a pool, you will be able to choose the amount of resistance you need to ensure that it is a comfortable level for you. If you don’t have your own swimming pool then investing in an above ground pool could be the perfect solution. 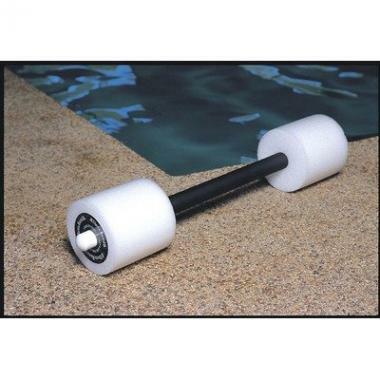 These are ideal for aquatic physical therapy if you have a pre-existing condition or when you are coming back from injury, as due to the controlled resistance that you have and the low-impact nature of the water, this is going to be perfect. 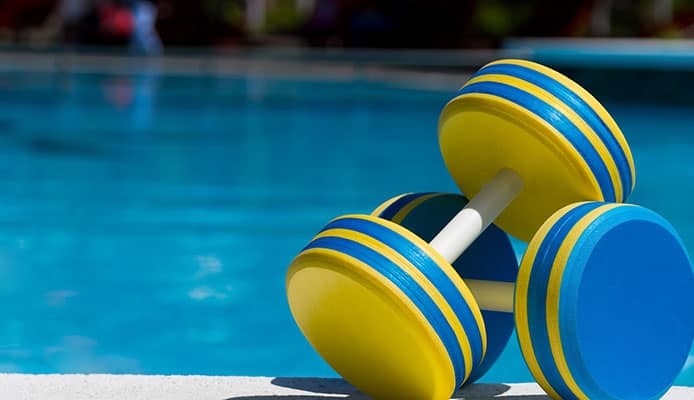 They can also be used for general fitness too, as the barbells will add extra strain to your pool exercises to allow you to increase your heart rate and improve your general fitness, whether you are swimming or doing a wide variety of exercises. A fitness tracker or waterproof Fitbit will be able to show you the progress you’re making. The barbells are also obviously great for strength too as you will be able to do a number of different arm exercises with your biceps and triceps but they can also add strength to your lower back and your core too, allowing you to increase your overall power and agility. 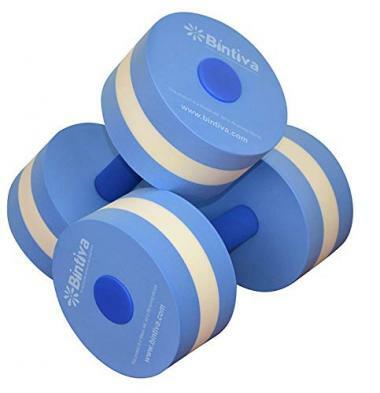 One of the best aspects of water dumbbells is the actual weight of the product, as they offer the complete opposite solution to actual dumbbells. This makes them very ideal to transport from one place to another. 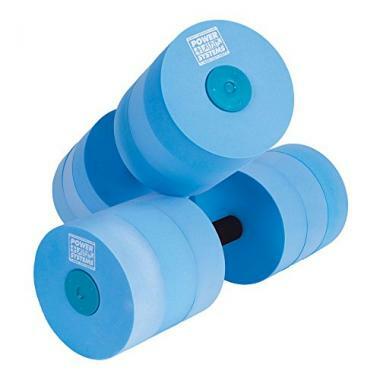 Whereas regular dumbbells use the force of gravity for their resistance and therefore the more they weigh, the harder they are to use, water dumbbells use the force of the buoyancy in the water and therefore weight has very little impact on how difficult they are to hold. When they are out of the water, you’re going to get next to no benefit from them but that’s not what they are designed for. Their design will allow you to have plenty of different exercises without having the danger or strain that regular dumbbells can bring. Due to the fact that they work on buoyancy, they can easily be carried in your waterproof backpack or your dry bag, also you will be able to change the amount of resistance that you have as you place them deeper and deeper into the water. What does make a huge impact on water dumbbells is the size of them. This is because the vast majority of them are made out of similar materials and therefore the larger they are, the more buoyancy they are going to have. A lot of companies will offer their dumbbells in just one size that is going to be able to give you a medium level of resistance. This is going to be ideal for most people as that will give you a great level of tone and the right amount of resistance for you. It could be though that you are looking to build muscle or are simply quite strong. In that case getting a larger product would be more ideal as this would increase the amount of buoyancy that you have and therefore increase the resistance that you are trying to push against. It could also be though that you are looking to improve a condition like arthritis or are weaker and therefore need less resistance. In this case getting a smaller dumbbell would be the ideal option for you. This is simply a case of knowing your own needs and getting a product to match that. Most of these barbells come in a very similar design and shape. 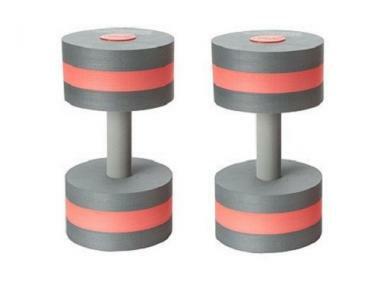 They will have to larger pieces of circular foam on their side of a handle in the type of shape that you would normally associate with the types of barbells that you often see when you are in the gym. The reason for this shape is that it will give you an equal balance on both sides. This is going to be able to give you a good an even level of buoyancy with which to push yourself against and allow you to do all the exercises that you need to get done. There are a few different options available which are still going to be able to give you a great level of resistance such as the plastic model that has panels in it almost like a windmill. This won’t offer much buoyancy but will instead offer a high level of resistance when pushed through the water. A hand grip is also available that will give you all-around buoyancy and allow you to complete a wide range of exercises. There is also a long-handle barbell which is great for various exercises and can even give you a high level of resistance when swimming. If you’re at a public swimming bath then you will always want to ensure that you are following the swimming pool etiquette. Q: What Are Water Dumbbells? A: Despite being similar to appearance as dumbbells, they are a lot different in terms of how they are used to regular dumbbells. 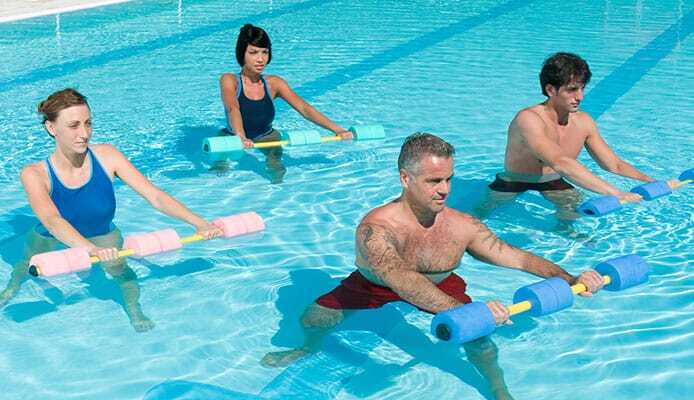 They are intended to be used as resistance against the buoyancy of the water to give you a great exercise option. They use foam so that you are able to fight against the force that is coming back at you. This is a great option for when you are in a pool as it is another low-impact exercise that is going to be easy on your joints and will be easy to handle. Q: What Are The Benefits Of Using A Water Dumbbell? A: The health benefits that you get from swimming are vast as it will enable you to improve your fitness while having the minimal amount of stress on your body. This will be able to help your lungs, your joints and your agility too. Water dumbbells are going to be able to increase that further and help tone up your body in the process. It can help to improve arthritis and a bad back to make you suppler. This will allow you to have more freedom of movement when you’re out of the pool. Q: How To Select The Right Weight? A: With these products it’s not the physical weight of the product that is important, as the weight of pressure that they push back is vital. This will be determined by the amount of foam they have and they more foam, the harder it will be. This will be a personal preference depending on your needs. Sometimes you just want to play fun games with pool toys and floats but at other times getting the right exercise is key. The health benefits that you get from water barbells will allow you to be more confident and enjoy a whole array of other fun activities. All that’s left to do is grab the best swimming goggles you can, head off to your nearest pool with your new water barbells and have fun using them. You could also get a waterproof MP3 player to make your exercise fun and listen to it with your waterproof headphones. They are a great product for a wide variety of different reasons and hopefully this guide has given you all the information you need to buy the perfect product for you.